languid curiosity – My words are in active pursuit of the truth and to quench my endless curiosity. Topics include: Race, Asian American issues, Opinions, Harvard, and figuring out jobs as a twenty-something. My words are in active pursuit of the truth and to quench my endless curiosity. Topics include: Race, Asian American issues, Opinions, Harvard, and figuring out jobs as a twenty-something. After a brief and harrowing time of being unemployed, I suddenly found myself with a highly likely job prospect…and it panned out for me. After sending out countless unsolicited resumes and cover letters, it turned out that the job I got was a job that found me — not the other way around. I am now an assistant to a director in a publishing house (many English majors’ would dream of such a job — you know, the “practical” creative English position). I’m actually going to be using my degree (shocker!). Basically, what happened was my previous supervisor for a place I interned a year ago e-mailed me about a job opening. While it was a wonderful e-mail, it would mean moving back to Boston (after such a difficult time I had deciding to move in with my boyfriend!). Of course, neither my boyfriend nor I were happy about having to return to long distance, but we both knew that since it had been so difficult to get hired since March (the time I began sending out my résumé), it would be foolish for me to turn down such an opportunity. Especially since I actually liked the place I would be working. When I was a child, I would start a new diary and begin with such fervor, endlessly documenting my life, activities, feelings for the first few days. Then my poor diary would lie on my desk, gathering dust. Then, after several weeks or months even, I would rediscover my forsaken friend and begin writing again, apologizing profusely to the small bound book. “I’m so sorry I haven’t written in you for so long,” I would always say. I feel a similar urge to say that here, to my readers, who have been so patient. Thank you for reading! The correct answer is too many things. This video of a girl slapping her boyfriend repeatedly on the streets of Hong Kong has become viral after two days, currently topping 930,000 views as I am typing. Without a doubt, it’s disgusting to watch as the girl beats her boyfriend in public. From what I gather, there was a dispute over whether the boyfriend invited another girl to his apartment (supposedly the other girl at the scene). I believe at one point he cries out that the second girl is the girl’s family member, and also he declares that he never did such a thing. Eventually a crowd gathers around and the girlfriend was arrested by police for assault. But I’m horrified…and not just because of this girl. This is nothing new. Cell phones and smartphones have become ingrained into our tech-savy societies today. When I was growing up, I didn’t have a cell phone until high school, and I didn’t get a smart phone until around my junior year of college. The thing is, I didn’t feel like I needed one. Since the campus had wi-fi, I could always check my email with my iPod. It was only when I went to renew my phone contract and get a new phone that I saw the not smart phone selection was of such poor quality! And now, ever since I switched from an Android to an iPhone (about three months now), I have become more addicted to those stupid games (Candy Crush Saga and Sims Freelife). And while yes, those games are fun and fill up those small voids of free time, such as sitting on a train, I have recently realized how much these phones disconnect us from people — and the people we love. I love the rain, the sound of the pitter-patter against my umbrella. The rhythmic beating against my window. The droplets that race with one another as I watch in the passenger seat. When you haven’t been able to break into the work force yet, you can feel rather defeated. It doesn’t help that most of your friends and peers are employed with six figure salaries coming right out of college. Talk about hit the ground running. There have been days when I have felt pretty depressed about my lack of employment. Even though it has only been three months since graduation, the looming sense of failure and rejection can even bring the brightest of spirits to its knees. Last summer, I — like countless others — read Anne-Marie Slaughter’s “Why Women Still Can’t Have it All,” and had several reactions to it. Aside from the class and racial issues I had about Slaughter’s article, it did raise interesting questions about feminism and work. Slaughter had the opportunity of becoming a powerful woman leader, at the peak of a political career in Washington — but she gave it up to spend time with her kids (and, you know, remain a Princeton professor). At the time the article came out, I was interning at Beacon Press, a non-profit press that promotes equality. When talking about the article with my (wonderful) supervisor at the time, she commented, “Isn’t this a step backward?” Back at the birth of feminism, women were trapped in the housewife role and wanted real careers. Now Slaughter was claiming that women still couldn’t be the mothers they wanted while having these powerful careers? I saw my supervisor’s point. Yet the past few months, I’ve been grappling with the conflict between feminism and my own desires. While I initially saw how Slaughter’s article could be anti-feminist, my recent struggle with feminist theory and my life have allowed me to better understand Slaughter’s claims. Feminist theory has fought against old ideas of what women can and cannot do — it has allowed women to join the workforce side-by-side with men. But feminism has now shaped what we expect a woman’s goals should be. It has created restrictions again on the definitions of a woman. Really, feminism should give women the freedom to choose their goals. I am supposed to be one of the privileged and educated women Slaughter was addressing. But I didn’t come out with a powerful job — in fact, I’m still pretty lost as to what I would like to do. I really enjoyed my summer internship, but as it drew to a close, I had to face a looming question. After my internship, where would I go? 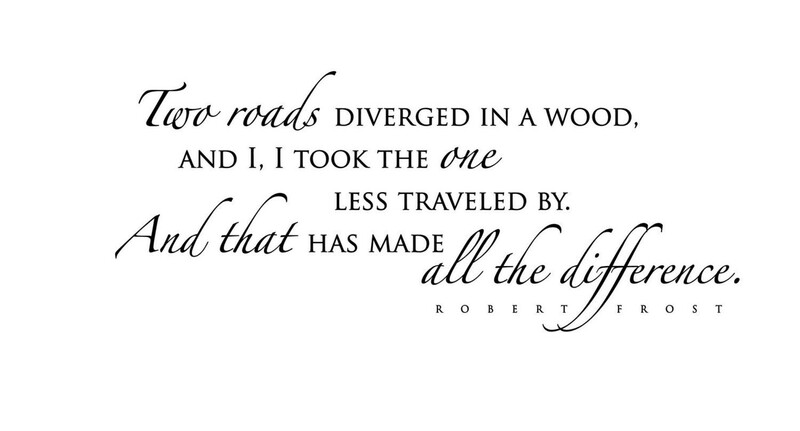 “The Road Less Traveled” was what I named my college personal essay. I wrote about wanting to be an English major despite my father’s fears of economic insecurity. It was my passion, I wrote. And now that college is over and I have secured my coveted English degree, I find myself down this woody path of dark undergrowth with nothing but my wavering passion to light the way. During a meeting of friends, a consultant who enjoys his work while not loving it asked the three present who had decided to take a more non-traditional route. For Harvard students, the “non-traditional” route is the one not necessarily paved with gold. The “traditional” route is often consulting, iBanking, academia, or something in the tech field. As someone interested in the arts or writing, I would definitely fall under the “non-traditional” route.